For my second month involvement in Amanda's Secret Recipe Club (where one receives an assigned blog to secretly write about) I eagerly anticipated my assignment email. Would I bake? Would I grill? With our 3 weeks of on and off vacation completed I was ready to head back into the kitchen and pull out my mixing bowls. Diving in, I stopped first at Deanna's "About" section and was immediately caught up in her carefree and entertaining writing. Amazingly, this gluten free Mom and I have a lot in common. We are both moms, probably similar ages (though I'm thinking I have a few years on her), enjoyed Gilligan's Island as a kid, and have been addicted to cereal. Yep, addicted to cereal. I wholeheartedly identified with Deanna's comments of bowl after bowl of the crunchy goodness, and yes, in my later years I've also switched to wheats and brans over the sugary kind. Deanna though, has after some 30 years of carting around her special cereal bowl become gluten intolerant. Reading about her journey into a gluten free world I could see a healthier way of eating and a lifestyle promoting a happier body. 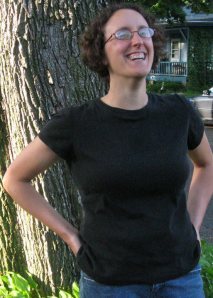 Understanding more of who Deanna, The Mommy Bowl, was I began to peruse her posts in search of a recipe to try. Caught up in her writing, I spent over an hour pouring over post after post and enjoying her special and enticing way with words. Smiling frequently along the way, recipe after recipe caught my eye. Who knew you could make a Triple Chocolate Cherry Pie not only raw, but vegan and grain free as well? And get this... it sounds and looks awesome. With 18 recipes printed I headed to the kitchen and almost immediately my teenaged son popped in proclaiming extreme hunger (it had been nearly an hour since his last Trader Joe's frozen burrito). I offered, "How about a Blueberry Banana Smoothie?" He pondered for a few seconds, said, "Yeah", and headed outside. Admittedly, we do understand intolerances. Last year my son suddenly became lactose intolerant and Liv struggles with her own lactose issues. As such do I occasionally search vegan recipes knowing that they will be dairy free. Frequently I adjust them adding eggs or grains, but with a dairy free base I've got a head start. 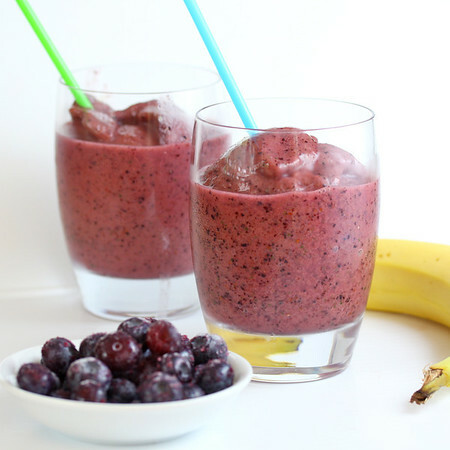 Deanna's Blueberry Banana Smoothie uses a few simple ingredients which we had on hand. 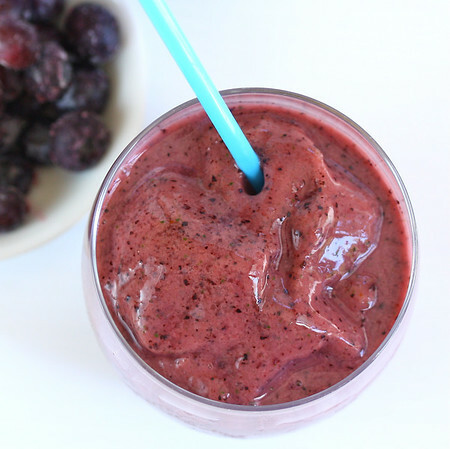 Vitamin rich frozen organic blueberries, a banana and coconut milk are enhanced with a handful of spinach for a nutrient rich smoothie packing a flavor enticing punch. Keeping the handful of spinach a secret, I whizzed the brightly hued ingredients in the blender and served up a beautiful blueberry smoothie with a tropical twist. Two smiles greeted the first tastes quickly followed by raised eyebrows as I explained that they were indeed drinking blended spinach in their sweet smoothies. Pausing for a few seconds, both kids shrugged and then continued drinking, draining their glasses within a few minutes and even asking for more. It seems Deanna is on to something. Next I thought about myself. With my husband out of town and the kids no longer hungry, Deanna's Raw Pesto Guac Salad caught my eye. As eating with abandon on our Trip to San Francisco was quickly followed by Pineapple Rum concoctions on the beaches of the Bahamas I'm a bit over food at the moment. Even I have been craving good, healthy veggies and a huge reduction in carbs and grains. Again, all of the required ingredients I happened to have on hand. Brilliant avocados, bright tomatoes and fragrant basil found their way into my blender along with the juice of a lemon from my dads tree, garlic and a pinch of salt. I prefer "chunkiness" in my salad, and therefore added additional diced avocado and more chopped tomatoes to the salad part. But here's where I did alter the recipe a bit... 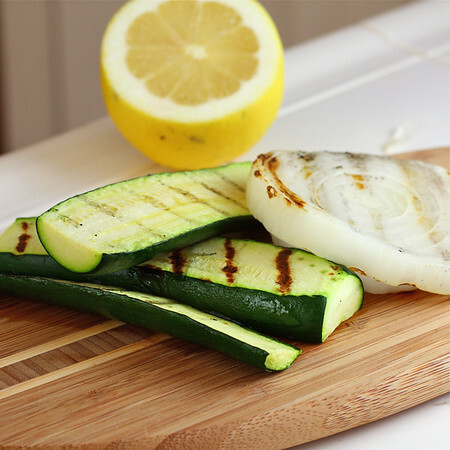 I grilled my zucchini along with a thick slice of onion (I'm just not a raw zucchini girl). And then I did it, I changed the whole dynamic and added pasta. I just couldn't help myself, but trying to stick close to the raw/gluten free theme I did only add 1/2 cup of cooked pasta for my serving. Stirring the brilliant veggies with the whizzed pesto had my mouth watering as the aromas melded together into something special. Setting myself at the table I dug into my healthy salad and sighed. Yes... this was the life! The antidote to eating with abandon and occasional rum drinks was right there in front of me and I loved every part of it. I topped off the meal with a few nuts (raw and salt free even!) and I was one happy and very content girl. While I don't think I'll be switching to a gluten free or raw diet anytime soon, I'd really like to thank Deanna for spurring me to explore another healthy way of eating. My post vacation mode has me filling my plates with a greater percentage of veggies and in an effort to reduce my vacation pounds I've even put away my own cereal bowl. Well, maybe not every night, but I am cutting way back. Deanna, I'm your newest fan! I will be following eagerly and feeling better along the way. Thank you! Throw it all in a blender and whizz it up. Add more coconut milk if it’s too thick. Deanna's Raw Pesto Guac Salad is a new favorite! 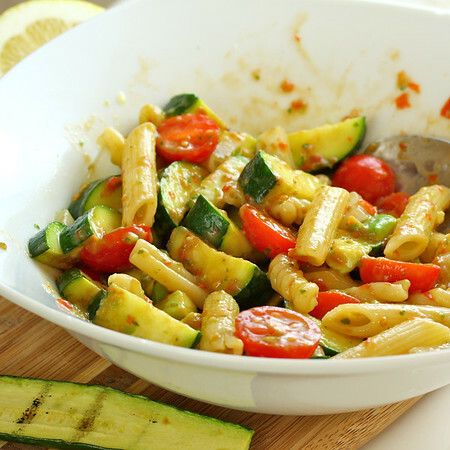 I loved everything about it and used the leftover pesto for 2 additional meals. Healthy and flavorful, this salad will be a regular in our rotation. 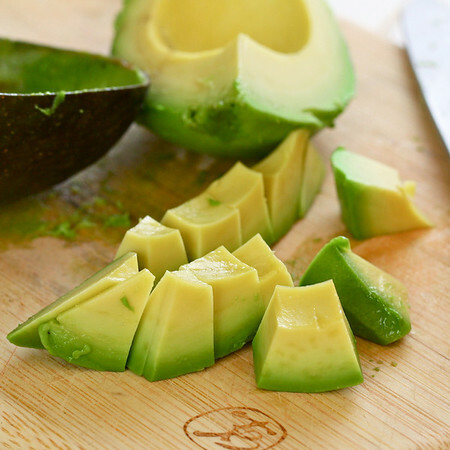 Put first 9 ingredients (avocado through pinch of salt) in a blender or food processor and process until smooth. Place next 5 ingredients (avocado through pasta) into a bowl and give a stir. Add desired amount of the pesto and toss to coat. 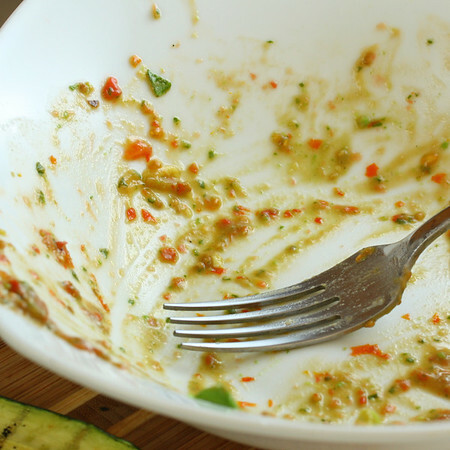 I had enough of the pesto to last for about 3 bowls of the veggies and pasta. I simply stored in a covered jar in the fridge and added what I needed for the salad. Yep... I liked it that much! Oh wow, that is all so delicious looking! I love the colors...always grabs my attention when something is so vibrant! Not just one, but TWO great recipes! :) I am especially in love with the banana bluberry smoothie, mostly because of the coconut milk, it sounds so interesting. And of course, I love anything with avocado. ;) Haha, thanks for sharing! The pesto guac salad looks very interesting! I would have never thought to combine those flavors. Both look as gorgeous as they are delicious and healthy. Love the idea of "sneaking" the spinach into the blueberries for some extra nutrition, too. Oh well done on all counts! I wasn't too thrilled about that pesto guac until I saw your finished salad and read your description. Now I want to make it! Both recipes look and sound delicious! I love pesto, avocado just seems like it would be a perfect match. Wow - what a wonderful review of my blog and my way of cooking/uncooking. Thank you SO much! I'm thrilled when I hear that I'm able to help someone else make some healthier choices. Your photos are gorgeous, too! Now I need to get back on my own healthy bandwagon - I just got back from a week in Mexico and yah, one too many bowls of chips and salsa. Oof! Great SRC post! Fun! and of course delicious! Wow ... that smoothie looks and sounds delicious. I do believe it may be my breakfast tomorrow! Oh, I got your blog as my SRC blog assignment this month and I had so much fun looking through it! I'll definitely be back often! One of my favorite things about SRC is being exposed to cooking styles and ingredients that are different for me! You did great, and that smoothie especially looks wonderful!! I love avocados. I would have used the extra avocados to make a shake! Yum! Love both of these recipes! Great SRC post. Both of your dishes sound wonderful, great SRC choices. This is like the first day of school and even though there are tons of new faces - I am super excited to see the ones I know! Both of these recipes are just amazing. What I wouldn't do for that smoothie right now. I love the guac pesto with the salad! A must try for me! I would have never dreamed of adding spinach to a smoothie. But, thinking about it now, I can see sneaking it in unnoticed since raw spinach doesn't have a strong flavor. That is a brilliant way to add a nutritional boost to an already nutritious recipe--it's hard to go wrong with bananas and blueberries. I happen to have all of the ingredients except the coconut milk on hand, so I may try it with almond milk instead. Can't wait to give this a go! Yum! Yum! I'm loving all these secret recipe posts! My sister is gluten intolerant so I'm always on the search for good recipes. Glad you shared this!! I love all things smoothie and the use of the coconut milk sounds dreamy. Thanks. The salad also looks fabulous. The smoothy looks good, but the pasta...wow! It sounds amazing! GREAT SRC post...buzzed! 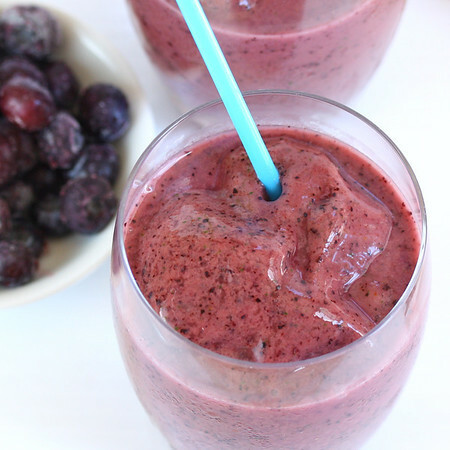 I could have a glass of that delicious looking smoothie right now! Great job! That's exactly what I love about the SRC... getting out of our comfort zone to discover and learn! Well done! Yum this is my kind of healthy pasta dish! I love the combo of avocado and pesto too. Great SRC find. Fabulous choices!!! The smoothies look delectable (and must taste fabulous if you got your children to drink them with spinach :))...and the guac/pasta gets my approval, too! Happy to know you're in Group C, too!!!! Very nice..your pictures really capture it all! What a Mum! Teenage son hunger pangs are stylishly taken care of via 2 wonderful recipes. Great going, Kim - also on the special diet front. Stunning! That guac pasta salad looks really good! Pesto and guacamole make everything better!! Great way to step out of comfort zone! I am loving the idea of that salad. The great thing about SRC is how it makes us leave our comfort zones and explore new ideas in the kitchen. Great picks! Excellent choices, Kim! With healthy, colorful, and delicious fresh fruits, and veggies like the ones you chose, i'ts not so difficult to be a vegan, at least once or twice a week for someone who is a meat lover! Your post is excellent, and in such detailed perfection! Love the smoothie with the spinach sneaked into it...surprisingly enough, it didn't turn green! So glad the smoothie was so good that the kids just shrugged at your spinach reveal :) It's good to get out of our comfort zones now and then and SRC sounds like a fun way to do that! Congratulations on the awards...take both, or one, the choice is yours! We add spinach to most of our smoothies and my kids love it. Their favorite and most requested smoothie is actually bright green. Once I got over the whole "spinach and green smoothies" issue, I found a whole new world of awesome smoothies to try! Just so yummy looking! Beautiful pic and I love the guac, too! Love the sharing that goes on at SRC.